The Stone St. Michael’s 10K is a non-profit race. All proceeds are shared between St. Michael’s CE (VC) First School and Stone Outward Division Girlguiding SMILE project. Since the race was re-introduced in 2005, we have raised in excess of £10,000 for our good causes, last year saw £4,000 distributed between our charities. Here you can find out in a bit more detail where your entry money goes. St. Michael’s First School in Stone is a Church Of England school founded in 1832, with 360 children currently on roll. Our Kenyan Story International guiding and service projects are part of the guiding programme It aims to give girls & young women the opportunity to have a greater understanding of world and cultural issues. Our Kenyan Story Smile (Supporting Mombasa in a Learning Experience) is the name the girls gave to our first project in 2005 and has become our “trademark” both here in the UK and in Mombasa. International guiding and service projects are part of the guiding programme which aims to give young women the opportunity to have a greater understanding of world and cultural issues. Background Our interest began in 1999 when we first heard of the needs of children in a specific school outside Mombasa. Many of the units started to sponsor children and in return receive information about the child. This simple act forged a link that we built on. We felt that it would be a wonderful opportunity for the girls in the 14 -18 year age group to have the opportunity to visit Mombasa and work with the people and develop and understanding and appreciation of life in a third world. The first project Skills needed to carry out the project were identified and training sessions were undertaken. These sessions were led by professionals from the local community as a donation towards the project. This was the first learning phase for the girls and included joinery, painting and decorating, Aids & HIV, leading summer school sessions, speaking Swahili along with many more. In addition the girls had the raise the funds to cover all expenses to enable to project to take place. They raised a total of £32.000 In advance we paid for the external and internal walls to be plastered so that they we could decorate them. 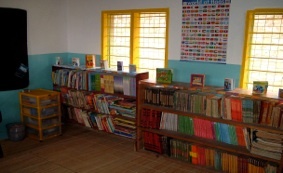 A library was defined from an existing room and 1000 books donated from the UK. We built bookcases and notice boards. We fully equipped the classrooms. Electricity and water were installed. We paid for new school uniforms to be made by a lady in the local village for all 350 children. We led summer school sessions for all the classes in the school daily In addition we linked with guiding members from Mombasa and spent some time with them sharing all that we have in common. 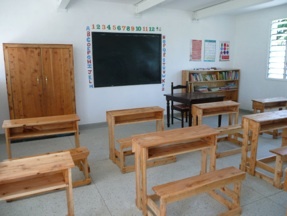 This project was a hugely successful and the village of Shanzu benefited greatly. Mikoroshoni School was transformed. The village is called Kididema and it is near to Mtwapa about ½ hour from Mombasa City and lies in farming country. There are approximately 5000 folk living in mud made homes and have nothing, no water or electricity just a school building which the rains are swiftly washing away but they have hearts as big as mountains. 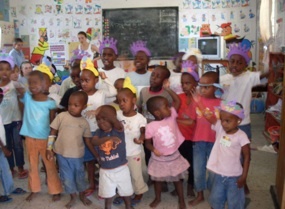 There are very many children, many of which are orphaned and looked after by families in the village. They have built small homes to put them in. There is a school approximately 2 miles away which the older children can go to if they are able to pay a nominal fee, most cannot. The women work small areas of land with children to give them a source of income. They have to walk for approximately 2 hours to get water and have no resources for health care or other income. 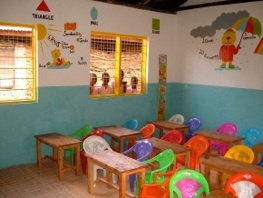 The council gave them a small amount of money to build two classrooms in the village and this they have started. The classrooms were built and the footings in for two more which was possible because they have sold two cows so that they can continue with the building. This shows the determination of the people to help themselves. The buildings are the most basic brick structures but a huge benefit to the people. They have no equipment beyond a piece of wood used as a blackboard. The Landowner has agreed to sign over the acre of land to the community so that the school can be built to meet the needs and we could develop it further to give them a church / community room and health centre. These proud people do not want us to come in and take over their lives and order it, they simply want a helping hand to become self sufficient and to give their children a future. Illness is rife because of the lack of water and hygiene and this has accounted for the deaths of parents who had HIV and Aids resulting in the number of orphans. This will continue unless help is given. I visited in November and held meetings with the Landowner and his family, Headmaster, Village Chief and the Management Committee. I worked with a solicitor to draw up the papers which will hand over the acre of land to the community from the Landowner. This is in order so we can proceed with our third project at Kididema. We had sufficient funds and a donation to put water into the village in November and this has made a huge difference to their lives. We also completed the buildings which had been started. This is an ambitious plan and the community would need to sustain it once it was complete. Initial discussions have shown that this is possible. 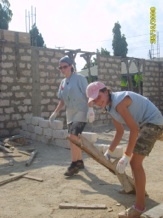 The bulk of the work would have to be completed before a team of girls could work there. 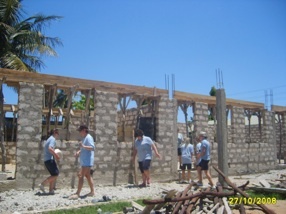 The team could then do all the work once the main structural work is completed. From initial findings it is expected that to complete this project we would need approximately £50,000. The new team has been selected and will train and raise funds and travel out in October 2012. The training programme began in January 2011 and will cover many subjects including Health, religion, social issues Swahili speaking AIDS & HIV Joinery Building & plastering Goat rearing Painting Plumbing First Aid Health & safety Manual handling Team building Summer school programmes We are very aware that none of this could happen if we did not have such a lot of support from the local community and the new team of girls and leaders will be prepared to work hard to make this become reality, it is all achievable. Our Guiding Links in Mombasa Coast Region Girlguiding Stone Outward Division has forged a very significant link with Guiding in Mombasa. On the first visit we made contact with the Guide HQ at Shanzu and visited many units and shared our common love of guiding. The Guide HQ at Shanzu has a workshop where disabled young women can go each day to learn how to earn an income from making lovely quality gifts from material. There is also a camp site and girls who can, go there to camp although they do not have a lot of equipment to use. There was such enthusiasm and friendship shown for guiding that we took the opportunity to open a Guide unit with help and support from Christine the region trainer and local commissioners. 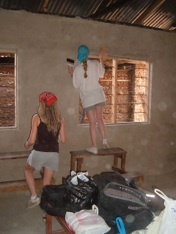 A volunteer leader was recruited and trained at the Guide Headquarters and in October 2008 we had the privilege of enrolling her and 15 girls at a special ceremony in the Church of Zion which we had funded and built for use by the church and community. We purchased uniforms for the girls and also 4 tents so that they could camp. To say the girls were excited was an understatement. These girls come from very poor backgrounds they live in mud homes with no luxuries at all. They do not have running water or electricity in their homes and very few clothes. To have a guide uniform was a really big deal. Guiding has become very important to them; they meet twice a week for an hour. There is no electricity or water in the church so they could not meet for longer as it goes dark at 6pm. The girls from Tumaiani visited a campfire that we held at the Shanzu site and it was a wonderful experience for them to meet other children and this helped to integrate them into the wider community. We therefore, with Christine’s help opened a Brownie Unit for them on 2nd September 2009 “Tumaiani Brownies”. 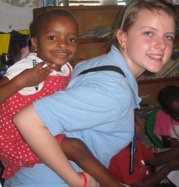 We purchased their uniforms and they meet twice weekly in the newly opened school with Jill as their leader. An enrolment ceremony was held at a conservation park whilst I was there in November 2009. As there are now two older girls at Tumaiani it was necessary to start a Guide unit for them. This we have done and there are now girls from the local area in Bamburi attending with them and they have a wonderful time and have been to camp for Thinking Day this year. The boys from Tumaiani were feeling very left out and we felt that we should try and provide scouting for them. This has been established and we have opened a Cub Scout unit for the boys and have paid for their uniforms which they are very proud of. The leader for the group is Omar and he is very enthusiastic. Our local cub unit in Aston is linking with the unit and this is a great for them to have this link with scouting in the UK. Girlguiding Staffordshire’s International Camp “Unity” was held in July / August 2010 and they invited a group from the unit to come to. When I visited in November 2009 I discussed this with Joshua the Pastor and Headmaster whom the community trust and had made Guiding possible for them and also Christine. They felt that if the parent’s agreed they would try and make it happen. I invited the mothers of the 5 oldest girls to meet me after church and I put this to them. They were shocked, worried and excited. Nothing has ever happed to anyone in the village like this and there was an element of disbelieve. They gave permission, and 5 Guides, with Christine and Joshua travelled to the UK. Without Joshua accompanying them they would not be able to leave the village. They did not have birth certificates which were needed to obtain a passport so this was step one. We then had to get passports and a visa for them, again not easy but Guide HQ in Nairobi agreed to help and we did, after a lot of problems get them. They had never seen an airport or aeroplane and had not been to the city of Mombasa which is only half an hour from Shanzu so it was a real shock for them. They did not have clothes or anything to bring with them. The five villages in Girlguiding Stone Outward each agreed to look after a guide and have a suitcase ready for them when they got off the aeroplane with everything they needed to go to camp and to stay for a week in the homes of girls that they met in Kenya. Maddie Bennett who is a young leader in the Division and took part in 2008 project was so attached and emotionally involved in the work we did that she went back for a month in both 2009 &2010 on her own and stayed with a friend of ours. She ran guide meetings and also took the guides to camp for the day and taught them basic camp skills. Both she and they had the most wonderful time. What this meant to the group of seven is not possible to put into words and to say that it was an opportunity of a lifetime does not come close. I know that you can not imagine what there life is like in Shanzu but they are very happy and never ask for anything. The opportunity made a huge change in their lives and helped them to further guiding in Kenya on their return. Conclusion All of this represents a huge commitment in terms of time and energy but to see the way in which the people of Mombasa respond to help offered makes it worth every ounce. Giving our young people this opportunity to help others in such a way and for them to gain so much for themselves is something I am very proud of. The guiding part of our work is very significant and has opened up many opportunities for members from both countries. They develop skills that they did not realise they had and it has influenced the futures of the girls. Three have gone on to do voluntary work overseas in a gap year and all parents are immensely proud of what their daughters have achieved, as I am. You cannot put a price on this! As a school we strive to develop our children as life- long learners and instil in them a passion for learning. We are very fortunate to have extensive school grounds which include a large playing field, woodland nature area and outdoor classroom all of which help enhance our childrens’ learning. Our PTA helps to raise money to spend on improving equipment and resources to enhance our childrens’ education and the facilities in the school. Currently, we are working towards raising funds to further develop our outside areas to make our outside learning experiences even more exciting. The School Council have asked for more playground equipment and there are plans to develop different areas that this can be used in, as well as putting a new trim trail in place for all of the children to access. We are also looking at renovating our pond area so the children can enjoy even more outdoor learning. We have excitedly launched our first ever Summer Online Auction, sponsored by Little Kickers. We have some amazing prizes such as a Mind-Less course from Su Guest at Heart Space, Foodies Llandudno vouchers, Dimensions Leisure Centre tickets, Balance and Beam summer holiday camps, Chocolat@22 voucher, Touchstone Wines Bastile Eve celebratory tasting of French wines, Meerkat Experience at Hoo Farm, Star Parties voucher to name but a few. The auction will run until 9pm on Sunday 18th June. The auction is online only, so you can take part from anywhere by smartphone, tablet or computer. Please follow the link and bid on as many or as few items as you fancy. You can then collect your winning items at the Summer Fayre and Stone St Michael’s 10K Road Race on Sunday 25th June between 10am and midday or in St Michael’s CE (VC) First School office following the event. If there is nothing you are interested in bidding on, you can still support all of our children by clicking on donate and giving a one-off donation.